I woke up this morning and left Lander’s town park around 9am. First I found the bike shop, but it didn’t open until ten, so I got directions to the library and post office. I find the PO, and it doesn’t open until 10:30… so I go to the library, and the library doesn’t open until ten! I’m too early for this town! By now it’s close enough to ten, so I wait around the library and meet Ian(From Britain), who’s cycling from Argentina to Alaska! That’s quite a trip, and he uses the library’s computer primarily to read up on Tour de France updates. There were a lot of people waiting for the computers, so I barely got anything done. Then I went to the post office, mailed some maps and small junk home, and made my way back to the bike shop. Almost a week ago, I’d noticed that the back rim on my bike was developing some cracks where the spokes screw into it, already rendering one spoke to be useless. I could still probably get a fair deal of mileage out of it, but I figured it’s time for a new rim, before I start popping multiple spokes in the middle of nowhere. The shop here in Lander didn’t have the proper wheel that I need, so I called the bike shop ahead in Jackson, a town that’s a full two or three days’ ride from here. They didn’t have one either, so I went ahead and put in a mail order for a new wheel from the shop in Jackson. Rather than pay for overnight shipping, the wheel wouldn’t arrive there until this Friday. Today is Saturday, so all of a sudden with one quick decision I’ve found myself with a number of days to kill. A lot of various touring cyclists started filtering in to the shop, and I found myself hanging out there on the sidewalk in front of the shop for most of the afternoon. 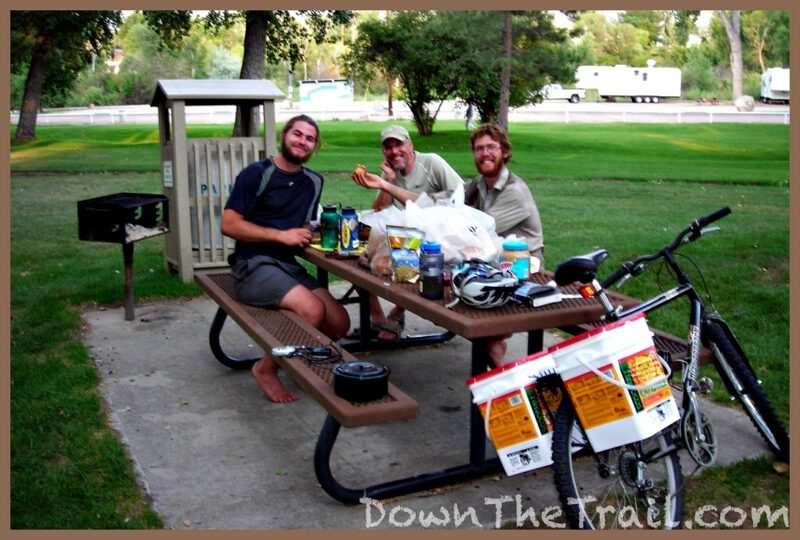 I met two guys that are doing a combination of backpacking, hitchhiking, and mountain biking through Wyoming and Colorado. 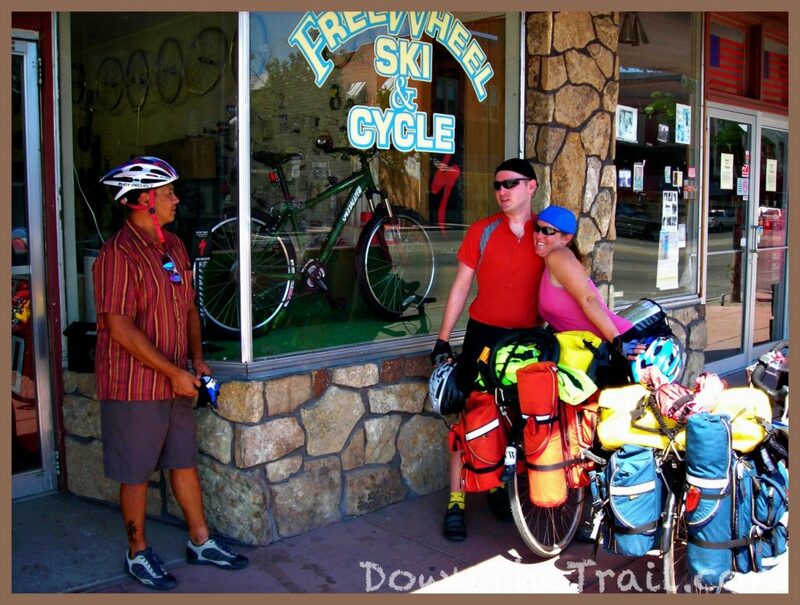 They just recently decided to switch over to bicycles – so they sent their backpacks ahead to Steamboat Springs, bought some used mountain bikes, and got some plastic kitty litter tubs to use as panniers. They’ll be heading out at 3am tonight. I also met Rudy from Florida (A solo eastbounder), as well as another eastbounder whose name I forget… and then Troy and Melissa Clough caught me – the honeymoon couple that I met back in Kansas on July 3rd! So you can imagine all of the sharing of stories, comparisons of gear, and various “shop talk” that went on in front of the shop today. I had it in mind to find employment in town for a few days, so when everybody dispersed, I started to ask around town about this. I checked at four or five different restaurants, but nobody needed any help. There’s a coffee shop/cafe that I want to check tomorrow morning, and if they don’t have anything, then I think I’ll head on up to Jackson anyway and figure it out from there. It would be a fun experience to work somewhere for a few days, and I think I’ll have to eventually anyway. I’m really enjoying this trip. It’s much more fun and has less hardship than I’d anticipated. If I were in San Francisco today, I’d be looking for a job to finance riding to the Grand Canyon and seeing the Southwest. We’ll see if my attitude changes between now and then. This evening I did some email, and met even more cyclists – Justin, Maya, and Rose… westbounders! Tonight Justin, Rudy, and I were up into the night swapping stories… for example how some locals passed Rudy a couple times and yelled “Ruuuuuudy!!! You can do it!” Life is good. 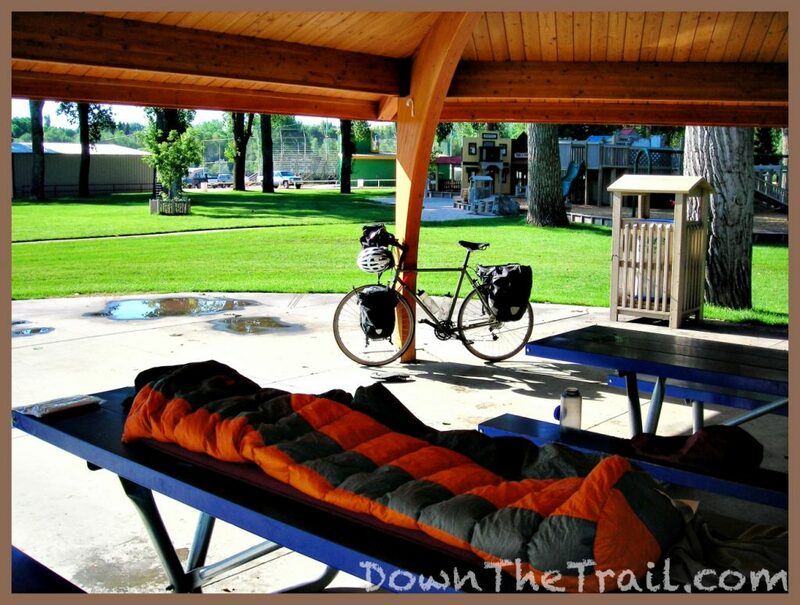 …at the town park campground. 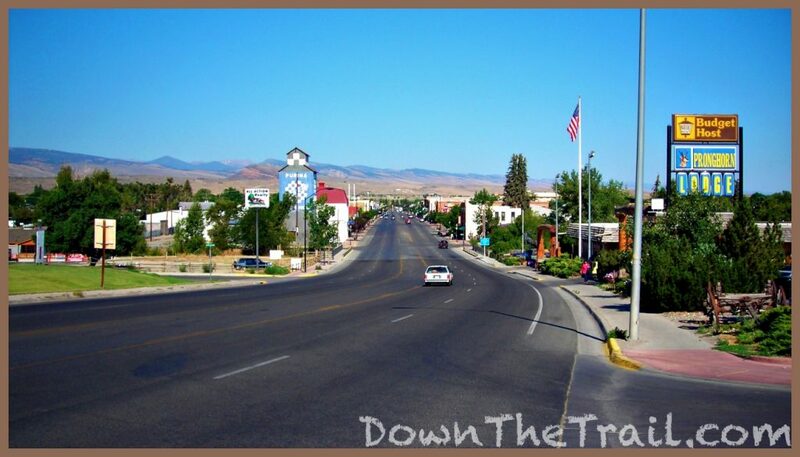 Lander is such a cool town – they let folks camp here for free!